Roland’s Boutique range recreates three of the company’s classic synths at a fraction of the cost of the originals. When Roland announced the Boutique series, we knew that they were going to be small. But that was a misconception. They’re not small, they’re tiny. In fact, you can fit them into the pockets of a WWII Luftwaffe greatcoat. (I know, because I tried.) That’s no mean feat, because you can barely fit one of the smaller synths on which they’re modelled — the JX3P and Juno 106 — into the whole coat, and the Jupiter 8 won’t fit at all. So if these tiny little synths sound as good as they look and suffer from no insurmountable problems, we might have to redefine what we consider to be a serious, professional synthesizer. Although the front panels and controls of each model are determined by the designs of the three original synths on which they’re modelled, the underlying digital architecture is the same for each, and has no physical relationship to the VCOs, DCOs, VCFs, VCAs and other analogue goodies promised by the paint jobs on their control panels. Roland call this technology ACB (analogue circuit behaviour) and it’s the same system that the company developed to power the digital products in the Aira series. As Korg did a few years ago with their Component Modelling Technology, Roland claim that the ACB algorithms model the responses of the discrete components within each synth being emulated but, given the hundreds of such components in even a simple synthesizer and all of the complex interactions between them, I am skeptical. Circuit modelling, as suggested by the name, seems much more likely given the CPU power available. When a virtual analogue synth takes time to warm up and then goes out of tune between the soundcheck and the gig... that would be evidence of component modelling! Either way, this doesn’t point to a deficiency in the technology (which provides remarkably accurate analogue emulations with only the faintest hint of digital artifacts if you intentionally go hunting for them at high frequencies), merely to possible over zealousness on the part of the marketing department. All three synths offer Solo, Unison and Poly modes although, like the Aira System 1, polyphony is limited to just four voices. 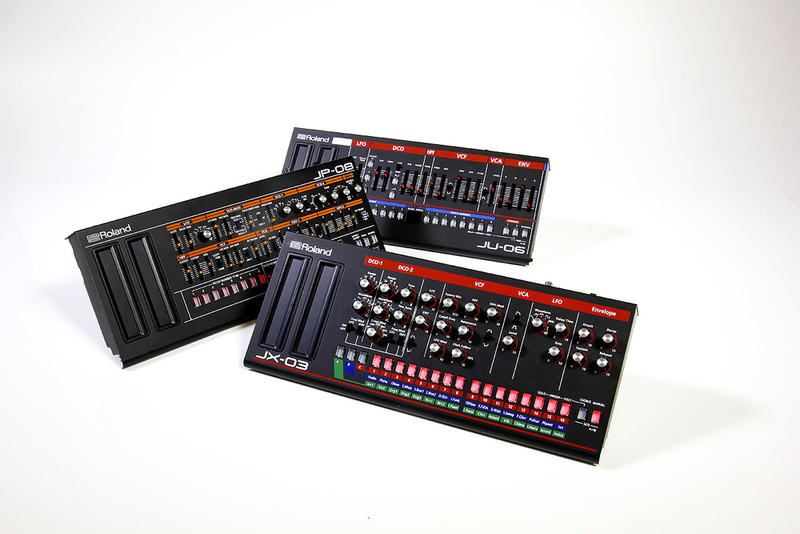 Perhaps insufficient CPU power is available to generate six or eight ACB voices but, whatever the reason, it means that you have to buy two JX03s and connect them in Chain Mode to obtain the six voices of a JX3P, you have to buy two JU06s to obtain the six voices of a Juno 106, and you have to buy two JP08s to obtain the eight voices of a Jupiter 8. This isn’t trivial. In fact, it’s bloody annoying. If the company is going to make these modules look like the originals, I think that it’s reasonable to expect them to act like the originals. A Ducati 900 with half the wheels? Harry Kane with half the legs? A Jupiter 8 with half the voices? None of these work for me but, to be fair, there are many players who confine their use of analogue (and analogue–style) synths to bass lines, monophonic sequences and effects, so Roland could perhaps claim that they’ve lowered the cost of obtaining these sounds for players for whom polyphony isn’t important. At the other end of the scale, you can chain more than two Boutique synths, so only your finances might stop you from creating mega–synths with 12 or 16 voices... or more. My concern would then be latency. Would (say) the voices generated on the fourth module play noticeably after the first? Perhaps someone wealthy could try this and let us know. Oh yes, and although Roland don’t say so, you can successfully chain different models if you wish. I’m not sure what the use for this would be, but no doubt someone will find one! All three Boutique synths share pressure–sensitive pitch–bend and modulation ribbons, and there’s a hidden and undocumented function here. If you press the Manual button and the 11th patch button, you can set the modulation ribbon to hold the last value rather than snap back to ‘zero’. This is equivalent to having an un–sprung mod wheel, and very nice it is too. Furthermore, if no MIDI connection is made, pressing the pitch–bend ribbon allows you to audition sounds using your selection from 16 note scales. In sequencer mode it even allows you to enter notes so that you can create sequences with no keyboard connected. That’s a nice touch. Ah yes, the sequencer. All three synths incorporate the same monophonic, 16–step sequencer. This is perhaps a bonus when compared with the Juno 106 but, in my view, it’s a big step down from both the six–note polyphonic, 128–step device in the JX3P and the arpeggiator in the Jupiter 8. In truth, I never used the JX3P’s sequencer because, by the time that I acquired one, my Atari ST was taking over all such duties, and it was much quicker and simpler to use this than reverting to an on–board unit. But, as a scratchpad, the JX3P sequencer had its fans, and probably still does. Viewed objectively, the Boutique sequencer does what’s claimed of it but, with such a limited set of buttons available (none of which have legends to tell you what does what in sequencer mode), it’s inevitable that you’ll become knotted up in the various combinations of presses that allow you to program it. What’s more, you can’t synchronise it to the outside world, nor vice–versa, which I fear will render it pretty useless for a lot of people who might otherwise make use of it. You can run all three synths from the four AA batteries supplied, and all three can be played through the tiny speaker mounted within the underside of each. Furthermore, any of the three can be mounted in Roland’s new K25m mini–key keyboard unit which means that you can, if you wish, make melodic battery–powered squawks in the middle of a field. (In all likelihood, that’s where your parents/spouse/children/friends would prefer you to make your battery–powered squawks, melodic or otherwise, but that’s another matter.) Inserting the synth into the K25m is trivial. Just locate the pin on one side, release the second pin into the retaining hole, connect the 16–way ribbon, pop it up to the desired angle, and you’re ready to go. Having done so, you have at your disposal what could be the spongiest two–octave mini–keyboard ever built. Unexpectedly, this generates MIDI velocity and, since each Boutique synth offers you the choice of light, standard and heavy responses, the combination is good enough to test sounds, trigger effects and transpose sequences. However, I have to correct an error in Roland’s crib–sheets that could be fundamental to your purchase (or not) of any of these three synths. The documentation says that you can determine the “velocity value that will be transmitted when you play the keyboard”, choosing between fixed values of 64 and 127, and actual velocity. It then goes on to say that, (and I quote) “only when using the K25m keyboard unit”. That’s not only misleading, it’s wrong. The output VCAs of all three synths respond to MIDI Velocity, no matter how it’s presented to them. In other words, this parameter doesn’t determine how MIDI velocity is transmitted from the K25m, it determines how the synths respond when it’s received! Given that none of the originals offered this, it’s a huge bonus, and the combination of velocity sensitivity and MIDI CC64 (sustain) makes it possible to play all three synths with a degree of expression that was never possible on their vintage inspirations. Unfortunately, the velocity response is confined to loudness (it would be more useful if it were directed to the depths of the contours) and it’s a global parameter rather that one that you can determine on a patch–by–patch basis, which imposes further limitations on how you can use it. But it’s very welcome nonetheless. The other facility that’s common to all three models is a simple digital delay that, in common with the general setup parameters and the sequencer, you program using combinations of the Manual button and the 1–16 buttons. Its parameters are limited to delay time, feedback amount and delay level, but it nonetheless takes all three of the synths far beyond what is possible with the originals alone. Unfortunately, you can’t synchronise the delay to MIDI Clock or even to the sequencer, so you could argue that there’s no difference between using the internal effect or passing the output from the synth through a basic delay pedal. And you’d be right. I often find that it’s beneficial to have effects embedded within the patch because you can then fine–tune them together, but really, no MIDI Sync? In 2016? Even at these prices, I think that that might be a mistake. Having gotten to grips with the common attributes of the three synths, it was time to compare each of them with their inspirations. I decided to start with the JX03 and the JX3P. At first glance, it appeared that all is the same, with the same complement of knobs and switches, albeit laid out differently. But a closer look revealed that Roland have significantly extended the oscillator architecture on the JX03. Whereas the JX3P’s DCOs offer just three cyclic waveforms (ramp, pulse/PWM and square waves — with the addition of noise on DCO2) the JX03’s add sine and triangle waves, with the addition of pink noise on what’s called DCO1 and white noise on what’s called DCO2. (They’re not DCOs of course; the control panel references are merely graphic affectations.) Furthermore, the JX03 adds 64’, 32’ and 2’ options to the footages of both oscillators, and the original complement of two cross modulation modes — Sync and Metal — has been extended to Sync1, Sync2, Metal1, Metal2 and ring modulation. The final visible difference lies in the JX03’s LFO section, which adds ramp and sawtooth waves, plus noise, to the original options. All looked good, but as soon as I powered up the JX03, I noticed a problem. Whereas the original synth outputs a gentle ‘swoosh’ when its chorus is on, the Boutique’s emulation was very noisy — unusably so, in my opinion. I couldn’t imagine why anyone would intentionally program this, so I contacted Roland, whose response was quick, helpful and bemusing. “There are a couple of functions which are not described in the owner’s manual...” their man told me, and then explained how to select to reduce or even eliminate the noise (see the ‘Noise Annoys’ box). While reducing it to Low helped, it was still noisier than my JX3P, so I removed it altogether, which was much better in every respect. The JX03’s front panel.I now turned to the factory presets on both synths, and couldn’t have been more surprised by the accuracy with which many of the sounds from 1983 were replicated in 2015. Sure, not all were identical — the JX03’s patches sometimes sounded a bit more ‘open’ than the JX3P’s and, for example, I could identify which synth was producing the Voice (A16) and Funky Clav (B13) patches — but the results were nonetheless remarkable. So my next job was to program and compare some new sounds on both synths, and this was when I started to discover some differences between them. However, most of these were determined by the depths with which I could apply the contour and modulation to various sections and, in most cases, reducing the amount on the JX03 brought it into line with the JX3P. So, for example, creating a dramatic sync sweep on the original synth by applying the maximum contour amount to DCO2 (the knob at the five o’clock position) only required the equivalent knob to be at around the three o’clock position on the JX03. Similarly, the filter resonance is stronger on the JX03 than it is on my JX3P, so I could back it off a little to obtain the same results. All of this is, of course, a good thing: it allows the JX03 to do everything that the original can, and more besides. Moving on, I found that the additional waveforms and footages on the JX03 facilitate a whole new palette of sounds, especially when using cross–modulation. Similarly, the extensions to the LFO architecture can be significant as long as you don’t confine yourself to using it for simple vibrato and tremolo effects. Then there are the extra cross–mod modes. The crib–sheet describes Sync2 and Metal2 as “producing a greater effect”, but I’m not sure that this is correct, and it doesn’t tell you that they reverse the allocation of which oscillator is the carrier and which is the modulator. Unfortunately, this reversal means that you can’t switch from one mode to the next to compare them: you have to reprogram the whole oscillator section, which is daft. But despite everything else on offer, I found that one of the most valuable additions was the inclusion of the humble sine wave to the oscillators. As on Yamaha’s CS series, this allows you to accentuate the fundamental or add a sub–harmonic to sounds based on other waveforms, and very useful it is too. If I have a complaint, it’s that the JX03 offers just 16 user memories instead of the original synth’s 32, which seems churlish. I realise that you can back it up to store as many multiples of 16 as you wish, but it’s still a troublesome limitation and, on stage, I would struggle with it. Your view, especially if you expect that the JU03 will never leave your studio (or bedroom), may be more accommodating. It was time to move on to the next pair of synths, which were the JU06 and its inspiration, the Juno 106. Well, Roland say that it’s the Juno 106, but I think that its lineage is a bit more muddled than that. Clearly, the paint job is reminiscent of the Juno 6 and 60, and the high–pass filter on the JU06 is continuously variable as it was on the Juno 6. On the other hand, the Juno 6’s and 60’s ability to control the oscillator’s pulse width using the contour generator has gone AWOL, as it did on the Juno 106. (This is a great shame because it was a superb way to make the underlying tone of a patch evolve as it decayed.) Looking at things a bit more cynically, the Juno 106 significantly outsold both the Juno 6 and 60, so maybe it makes sense that the company should commandeer its name, but I think that there may be an even sneakier reason for doing so — the lack of an arpeggiator on something purporting to be a Juno 60 would be a glaring omission. But however you view all of this, the voicing of the JU06 is close to all three of the original Juno synths and, other than the differences described above, the only modification appears to be an increase in the maximum LFO speed. Since the same three chorus noise options exists on the JU06 as on the JX03, and because the chorus in my Juno 106 makes very little noise, I set the JU06’s noise to ‘off’ and then proceeded to compare its factory sounds to those that I reloaded into the original synth to conduct this test. Like the JX03, it offers half the number of memories as its inspiration (a single bank of 64 rather than two banks of 64) and, again, I have no idea why Roland did this. Whatever the reason, it was clear that only a subset of the Juno 106’s factory sounds could be offered, and I soon discovered that only patches 11 to 38 are copies, imitating patches 11 to 38 in Bank A of the original. They’re good, but they’re not perfect. This time, some sounded more ‘open’ on the original, while others spoke slightly differently, and so on. Fortunately, the differences (which, to some extent, could be consequences of calibration and component tolerances in the original synth) were largely unimportant, and I doubt that I would have been aware of them without the opportunity to carry out a direct comparison. Externally the JU06 Testing the JU06 in a more analytical fashion, I found that it recreated all the waveforms of the original well, including its PWM. However, I was surprised to find that the filter on my Juno 106 opens further than that of the JU06, which probably explains why some of its factory sounds are a tad brighter. Happily, the filter on the JU06 tracks the keyboard perfectly (as it should on the Juno 106), which means that you can use it as a second oscillator to duplicate the Juno’s emulation of the Hammond 88800000 registration as well as the ‘first and fifth’ sounds that were so popular on many of the dual–oscillator synths of the era. In fact, the JU06 sometimes performs this trick even better than the original, although there’s a range of breathy resonant sounds at which the Juno 106 excels (caused when the filter drifts a tiny amount from the exact frequency of the harmonic to which it’s locked) that I couldn’t imitate on the more precise digital synth. I also found that the maximum durations of the Attack, Decay and Release stages on the JU06 are longer than those of the Juno 106, which is a good thing because the original synth was always rather limited in the area of slow sweeps and gentle releases. My only real concern regarding the JU06 is its apparent inability to send or receive parameter value changes as SysEx, which puts it at a disadvantage when compared with the original Juno 106 and spin–offs such as the 106S and HS60. According to the MIDI implementation chart, SysEx is neither transmitted nor received, but this may not be entirely true (see the ‘The Boutique Synths & MIDI’ box) so I have my fingers crossed that, at some point in the future, we might see SysEx automation on all of the Boutique synths. Time will tell. The most expensive in the range is the JP08, which emulates the oldest of the three synths in the family, the revered Jupiter 8. 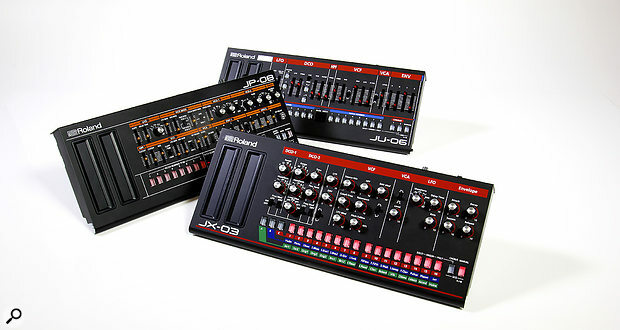 Before looking closely at the three Boutique synths I had a preconception that the difference in cost was predicated by the higher number of physical controls on this model, but counting them revealed that, with its 55 knobs, faders, switches and buttons, the JP08 has only three controls more than the JX03. Even the much simpler–looking JU06 has 44 controls, so construction cost doesn’t seem to be the justification. As with the JX03 and JX3P, there are some differences between the oscillator and LFO sections of the JP08 and the Jupiter 8. This time, the Boutique synth adds a sine wave and noise to VCO1 (which, again, isn’t really a VCO), subtracts noise from VCO2, and adds 64’ and 32’ options to both. Elsewhere, the LFO adds a triangle wave and noise, the former of which is welcome for a different character of vibrato and tremolo effects. The final two changes are cosmetic. The first I can understand: instead of having a key–follow on/off switch attached to each of the two ADSRs, a single four–position switch is provided. The second is just weird: while the modulation facilities of the low–pass filter are unchanged from the original, the order of the controls is different so, if you’re an experienced Jupiter 8 programmer, you’re likely to grab the wrong fader! The JP08 crams a lot into its 300 x 128 mm front panel.Since there was no chorus effect to adjust on this model, I plunged straight into a comparison with the Jupiter 8’s factory presets which, as before, I reloaded for the purpose. Happily (unlike the JX03 and JU–06) the JP08 retains the full memory structure of its inspiration, with 64 patches and eight presets comprising split or layered upper/lower patches. Nevertheless, as on the JU06, only a subset of the original factory patches — again, numbers 11 to 38 — are imitated. Once more, I was very pleasantly surprised by the accuracy with which the Boutique synth captures the sound of the original and, while I can’t say that the factory patches were always identical across the whole keyboard range, that’s probably because my Jupiter 8 is in need of a little re–calibration. Furthermore, the timings of the Attack and Decay stages on the two synths were different, and this was particularly noticeable when the filter was being swept. But even these sounds could be tweaked into shape without too much difficulty. Next, I moved on to re–programming some the sounds that I had overwritten when restoring the factory set, and I found that the accuracy with which the waveforms are recreated is stunning. Filter sweeps are also lovingly created, as are sync sounds. The only area in which I was unable to duplicate patches as closely as I would have liked was when using cross–modulation. However, this is not a criticism of the JP08, it’s more a comment on the less–than–perfect tracking of the oscillators on my Jupiter 8. Cross modulation is very sensitive to even the tiniest of tracking errors, so I suspect that JP08 sounds closer to the sound my Jupiter 8 made when it was new, than the Jupe itself does today! And, as on the JX03, the addition of the JP08’s new waveforms makes it possible to extend its palette into new areas that, far from detracting from its authenticity, proved to be valuable additions. Unfortunately, the loss of the Jupiter 8’s arpeggiator is not trivial and, while you can use the JP08’s sequencer to compensate for this to a degree, it’s not the same, especially since you can’t imitate random mode. Oh yes, and the Upper and Lower Hold buttons have disappeared completely. Nonetheless, the principal issue I have with the JP08 is its polyphony. This is much more significant here than it is for either the JX03 or the JU06 because, whereas a layered preset on a Jupiter 8 reduces its polyphony to four notes, which is still usable for chords and other polyphonic duties, a JP08 preset plays a maximum of just two notes, which is useless for pads, ensembles, and much else besides. 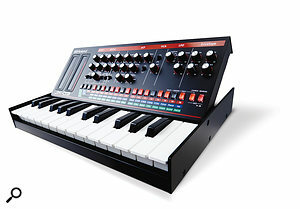 So, while the JP08 does a remarkable job of imitating the Jupiter 8 at less that 10 percent of the price of a 30–something–year–old synth that may be in need of a little TLC, I wouldn’t consider buying one of them — I would have to buy two for less than 20 percent of the price of a 30–something–year–old that may be in need of a little TLC. All three Boutique synths look gorgeous, are surprisingly solid, are fabulous fun, and sound remarkably like their inspirations. Nevertheless, their most obvious attribute is their size. Japanese manufacturers appear to have embraced mini–everything in a way that sometimes seems a little alien elsewhere. It’s not just a question of the mini–keys on the K25m or even the risk of losing one of the synths down the back of the sofa — many people will be concerned that the miniature sliders will be too small to adjust with the required precision. But the ‘feel’ of even the shorter faders on the JP08 is surprisingly good and, with care, I was able to make fine adjustments almost as easily on the Boutique synths as I was on the original instruments. But then we come to the issue of the rear panel. If Roland are hoping that these synths will attract the pros, they should have designed them with sturdier sockets. In the meantime, perhaps a dedicated case would help, not only to hold the synths in place and to protect them cosmetically, but also to provide supports and restraints for the cables. And then there’s the lack of a DC power input. If you have no computer to hand and the batteries go flat, you’re stuffed. Again, this probably isn’t a problem in your bedroom studio, but you’ll be right royally screwed if one suddenly dies in the middle of a gig. Perhaps a micro–USB power supply would be the solution, but nowhere do Roland say whether this would be safe or not. Clarification please! Unfortunately, the K25m doesn’t help in any of these respects, and I must applaud Roland’s decision to make it an optional extra. Those who have a use for it can buy it; those for whom it would be an unwanted appendage can ignore it. Either way, I must admit that I have concerns about how robust the flip–up plastic tongue that supports the synth will be in the long term, and how many times you’ll be able to connect and disconnect the ribbon cable before it becomes intermittent. If you’re tempted to buy one, I would treat the installation of any Boutique synth in it as semi–permanent rather than popping modules in and out with gay abandon. The optional K25m keyboard gives you two octaves of mini keys if you want them. Putting all of these thoughts together, I wonder how many players would be willing to pay more for versions that were rather less boutique but with full–sized keyboards, double the polyphony, larger controls, integrated power supplies, and robust sockets? Clearly, the powers that be at Roland don’t currently think that enough people would be interested to justify the investment, but I would love to find out. In the meantime, the existing range provides the sounds of these three classics in a format that a new generation of music–makers will find convenient and affordable. With a decent MIDI controller and a selection of Boutique synths, I doubt that any listener in the real world would be able to tell that you didn’t have a collection of vintage Roland polysynths at your fingertips. But, worryingly, Roland’s literature describes the range as “limited edition modules”, which concerns me because nowhere does the company tell us what is limited about them. Are they going to build a few thousand and then stop? If so, this begs the question of what they would then do with the technology. Given the use of ACB in various Aira products, it seems reasonable to ask whether the JX03, JU06 and JP08 would appear as plug–outs for the System 1, or even as conventional plug–ins. Whatever the future holds, I expect that some potential purchasers will wait to see what happens before handing over any cash, which is probably the opposite of what Roland intended. It’s clear that Roland no longer have a problem revisiting their analogue legacy: in recent times they have released digital recreations of the TB303, SH101, SH02, ProMars, TR808 and TR909, in addition to the three synths discussed here. But if you’re holding your breath for Roland’s equivalents of Korg’s mini– and kit–versions of the MS20, I fear that your face is going to turn purple and you’re going to fall over. That would serve you right; despite the recent announcement of their System 500 modules, at no time have Roland ever hinted that they intend to return to building large–scale, integrated analogue synths. But one could argue that, with these Boutique synths, the company have done the next best thing. Will the world’s synthesizer fanatics come out in force to heap praise upon them? I doubt it... But if so, they’re wrong. Sure, there are limitations, but you can’t claim that they fail to capture the sound and character of each of the synths that they imitate. Looking at them alongside the Aira series and the forthcoming System 500 modules, it seems to me that Roland are in the process of rediscovering their mojo. Why should anyone want to complain about that? Apart from a standard MIDI implementation chart (which tells you very little) Roland have not documented what the Boutique synths do with MIDI CCs or SysEx. So here are some conclusions that I reached through a lot of experimentation, many of which have since been confirmed by Roland Europe. My thanks to Roland Europe Group for confirming my initial findings and clarifying these issues with me. To use the Boutiques seriously, it’s likely that you’ll hook them up to a full–size MIDI controller or a computer (for which you’ll need the appropriate driver, whether you’re using a Mac or PC) and also to a decent sound system. To enable you to do so, their rear panels offer a micro–USB socket that provides power, a 24–bit/44.1kHz digital stereo audio output, and MIDI In/Out. In addition, all three models have MIDI In/Out on five–pin DIN sockets, and analogue audio I/O in the shape of 3.5mm stereo sockets for audio in, audio out and headphones. I understand why Roland chose 3.5mm sockets; robust quarter–inch TRS sockets are somewhat longer, and might have made it necessary to increase the depths of the synths themselves. Nonetheless, I have severe reservations about using 3.5mm plugs on stage. Likewise, it’s easy to imagine a micro–USB cable being dislodged, so some sort of cable retention would be vital for professional use. Unfortunately, while the analogue audio input suggests the possibility of processing external audio through each synth’s filters and VCA, this isn’t possible, and any audio presented here is simply passed unmolested to the unit’s analogue and digital outputs. Moreover, when I connected both the analogue audio input and the USB of any of the Boutique synths to my MacBook Pro, a strange, reverberant noise was generated (presumably by some form of loop). Roland need to address this. If, like me, you find the default level of chorus noise generated by the JX03 and JU06 to be excessive, you can reduce this or eliminate it entirely. You access the parameter by pressing the Manual button together with pad 12 on the JX03 or the fourth pad in the right–hand group on the JU06. You will now find that pads 1, 2 and 3 are lit, probably with the third flashing. Press one of these three button to select the chorus noise amount: pad 1 is no noise, pad 2 is a moderate amount noise, and pad 3 sounds like a bucketful of BBD chips with bronchitis. The default setting appears to be maximum noise, which, had I heard it in a shop, would have deterred me from buying either synth, so I’m at a loss to understand why the knowledge about how to eliminate it has been omitted from the documentation. None of the Boutique synths comes with any documentation worth mentioning. Instead of a manual, there’s merely an A3 crib–sheet with print so small that I was tempted to find a magnifying glass to help me to read it. Furthermore, as discussed elsewhere, these crib–sheets lack information about the chorus noise, the modulation ribbon, and the MIDI capabilities of each of the synths. I know that omitting a proper manual reduces production costs but, at the very least, one should be made available as a download, thus providing the necessary information in a readable format even if it passes the cost of the paper and ink onto the end user. Like many other facilities on the Boutique synths, you have to use combinations of controls to switch the portamento on or off, and to adjust its speed. In this case, you need to press the Chorus 2 button (JX and JU) or Dual button (JP) and the upper half of the first ribbon controller to switch it on (or the lower half to switch it off), and the same button and the second ribbon controller to set its speed. If portamento is to be a permanent aspect of a given patch, that’s no problem, but if you’re going to want to switch portamento on and off while playing, you’ll be stymied. Sonically, they are remarkably accurate recreations of the synths they emulate. They’re very attractive and they demand that you have fun. They’re very small, but seem well built and robust, and their controls are still usable. The JX03 and JP08 extend the architectures of the original synths in useful ways. The lack of MIDI Sync could be a limitation, especially for electronic dance music. The sequencer is basic, and it doesn’t transmit MIDI note data. There’s no MIDI control of voice parameters, so no automation. Four–voice polyphony is going to be a limitation for many players. They use lightweight connectors and there’s no conventional power input. I had huge hopes for the Boutique synths, some of which were exceeded, and some of which were dashed. They are remarkable emulations of their inspirations so, if you can live with four–voice polyphony, no MIDI Sync and miniature connectors, I can recommend them. If not, eight–voice versions with a full MIDI spec, professional connectors, and an integrated power supply would be almost irresistible. JU06 £229, JX06 £229, JP08 £299, K25m £75. Prices include VAT. JU06 $299, JX06 $299, JP08 $399, K25M $99.